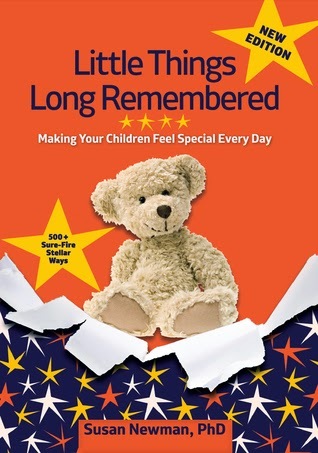 “Little Things Long Remembered,” updated for today’s time-strapped families, offers hundreds of ways to create treasured childhood rituals. Chock full of thoughtful and loving ideas that mean a lot—especially to children. Chapters are divided into convenient timeframes: Gestures to strengthen family ties that take seconds, activities when you have five minutes, half an hour, or the entire weekend. Plus special circumstance suggestions for when your child is not feeling well or when you travel, for birthdays, major and minor holidays--including a set of Cardinal Rules to insure whatever you do is fun, builds character and celebrates your family. Small parcels of time well spent shape long-lasting memories that are the backbone of family unity...and the glue that holds families together. Every single day offers fertile ground for creating positive recollections. Dig in to find “little things” that will inspire loving remembrances of growing up...and of you. “Little Things...” is the perfect new baby, Mother or Father’s Day, or any day gift for parents and grandparents. As a busy stay-at-home mom who these days never feels like she's at home, I can sometimes get into a rut when it comes to making memories with my boys. So, I was completely thrilled when this book turned up and I started flipping through the pages. While a lot of what's in it is really geared towards younger children, there are things that you could do with teenagers in it. As my boys get older, it's become more and more important to me that we create memories together. Before I know it, they'll have moved out and started lives of their own and I want them to be able to look back and say, "Hey, remember that time we...." This book is full of ideas and would be great for anyone who spends time with children.